PLANET in PERIL, your "one-stop shop" for the truth about our planetary crisis. : In Hogs We Trust - Part 111. In Hogs We Trust - Part 111. Losses suffered globally due to diseases of livestock, are staggering. As the Nairobi-based International Livestock Research Institute (ILRI) note, "Some of the most lethal bugs affecting humans originate in our domesticated animals. Thirteen of these (formally called “zoonotics”) are responsible for 2.4 billion cases of human illness and 2.2 million deaths per year. As more pigs and poultry are raised in concentrated spaces, especially in poorer countries, the risk of zoonotic disease rises. While the vast majority (of human casualties) are in low-and middle-income countries, the northeastern U.S. has emerged as a ‘hotspot,’ too!” Whatever the case, the authoritative Centers for Disease Contol in the States reminds us, we in developed countries, cannot afford to be complacent. On its website, the CDC proclaims, "We are living in an interconnected world where an outbreak of infectious disease is just a plane ride away." It has recently been reported that the rare virus called Nipah has re-emerged in southern India, killing at least 11 people and causing more than 25 others to be hospitalized. Although global health officials consider that, so far, to be a relatively small outbreak, they’re worried. And while no cases have been reported in Canada, scientists with the Canadian Food Inspection Agency have expressed similar concerns. Nipah is on the World Health Organization’s priority list of emerging diseases that could cause a global pandemic, alongside Zika and Ebola. In 1999, Nipah killed more than a hundred people in Malaysia and sickened almost 300 others. While fruit bats had probably been the initial carriers, the victims had all worked closely with pigs, which acted as intermediate hosts. 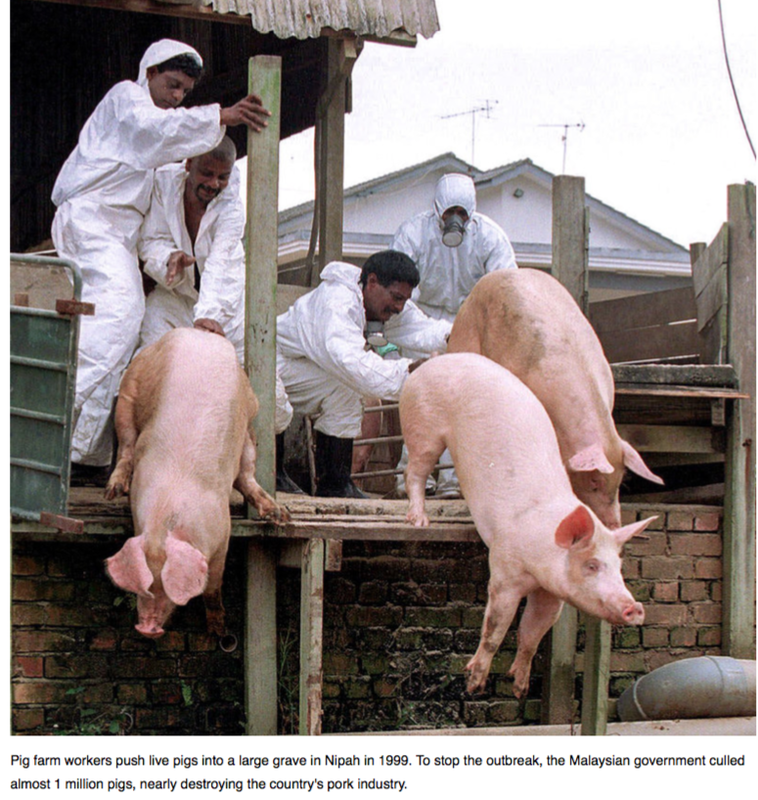 To prevent the spread of the disease, more than a million hogs were euthanized, inflicting tremendous economic losses on the Malaysian economy. of live animals into a pit. Photo by A.P. As the ILRI observes, “Notable examples of zoonotic diseases include ‘Nipah,’ which causes influenza-like symptoms, often followed by inflammation of the brain and death. It spilled over to people from pigs kept in greater densities by smallholders.” Health authorities still regard Nipah as “a growing threat,” not only because it can spread from person-to-person, but because there’s no cure. Some of the diseases referred to here, including Nipah, have been known to infect those who take part in the Raaj, the largest annual religious pilgrimages in the world, where animals are sometimes sacrificed. While “zoonotics” have not been as common here as elsewhere, the same cannot be said for diseases deadly to hogs - outbreaks which have proven - for much of North America - to be nothing short of rampant. In 2004, Canadian hog producers, found themselves in the middle of a “major animal-health crisis, worldwide.” A new variant of a disease called “Porcine CircoVirus-2 Associated Disease” (PCVAD), had infected Ontario’s swine herds with a vengeance. It seemed to closely resemble a strain that had first been identified in Saskatchewan 20 years earlier. And, not long before the Ontario outbreak, a similar kind disrupted pork production in parts of Asia and Europe, too. No hard numbers are publicly available on just how many pigs the outbreak has claimed. But an official said, at one point during the summer, almost a million were under surveillance. PED causes the animals to spew watery vomit from one end and diarrhea from the other. (See above.) 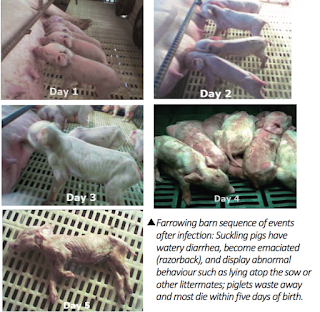 While some adults can survive, almost all infected piglets become severely dehydrated and die on about their fifth day. Years before the Manitoba epidemic, the writing was on the wall. The virulent disease was on our doorstep. By 2013, PED had begun sweeping, with alarming speed through more than thirty U.S. States, devastating the industry. Within a year, estimates on mortalities ranged from three million to seven million. That would have been between five and ten percent of the country’s entire swine population! The cost of pork spiked in the supermarkets. A year or so later, PED had arrived in Ontario. In another part of the world, the European Union, at this writing, was on high alert. After an absence of decades, a deadly viral disease called African Swine Fever (ASF) “re-invaded” three years ago. It is threatening both EU farm pigs and wild boar, who are believed to carry the disease. Despite heroic attempts by Lithuania, an EU country, to keep it at bay along its border with Belarus, the fever moved in. Then, it swept westward into Poland, the Czech Republic and three Baltic States. Infected herds must be culled. Photo credit - Science Magazine. 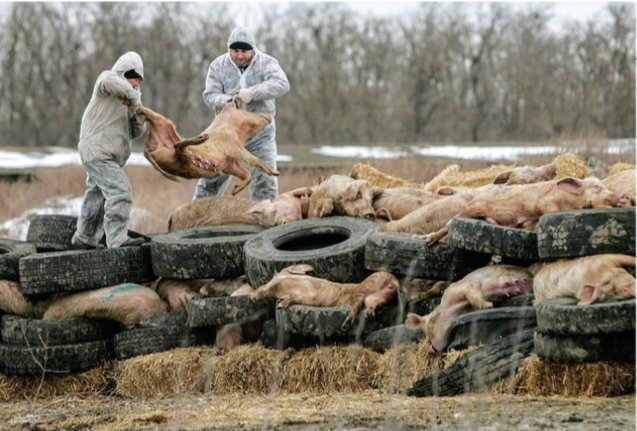 In Estonia, 22 thousand hogs had to be destroyed. Pork prices collapsed and more than a third of Estonia’s hog farms went out of business. The disease is now raising alarm in hog-producing countries like Denmark and Germany. With pork exports there worth billions, the stakes are high. That’s because any country where an infection is confirmed, might lose those markets. shown here are typical of pigs with African swine fever. Photo by Karen Apicelli USDA. ASF was first reported in domestic pigs in eastern Africa in 1921. It is harmless to humans. But it kills up to 90% of pigs. They start to bleed inside. Blood sometimes gushes from their ears and flanks. Their lungs fill with fluids. They lose their appetite and energy, abort their young and die, suddenly, within ten days. 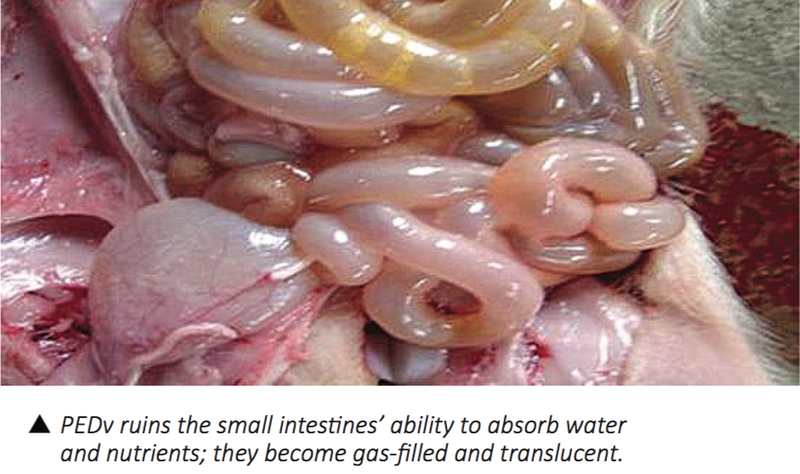 The virus spreads through the secretions of sick animals. It can survive for long periods on workers’ clothes or hay, helping it move from farm to farm. It can travel even farther when contaminated pork is transported. Pigs or wild boar become infected if they eat the scraps. Below is a video depicting the seriousness of ASF, produced by the European Food Authority. 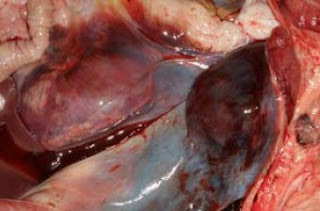 In a different part of the world, “Public Health England” (PHE), a government agency, has recently estimated that up to 200 thousand residents of England and Wales are being infected each year with Hepatitis E (HepE), mainly from eating undercooked meat, including pork. HepE is often not serious, but can sometimes cause liver failure in pregnant women and others with weakened immune systems. There are conflicting reports on the seriousness of some 60 cases over the summer, traced to imported pork products sold at a major London supermarket. PHE claimed the risk to the public was small, although newspaper accounts at the time, stated there had, indeed, been serious illnesses. The HepE strain responsible has been on the increase in the area since 2010. In 2001, a research team in this country concluded, “Hepatitis E is highly prevalent in commercial swine populations in Canada and…may be an important zoonotic agent for humans.” Those findings, however, have since been disputed, or at least played down. The lead author of that study, Dr. X.J. Meng, in an interview with me, hotly denied any suggestion that PED might cross over into humans. So, while PED is not a “zoonotic,” the same cannot be said for other coronaviruses. One of them, “Middle East Respiratory Syndrome” (MERS), claimed human lives in dozens of countries in and around the Arabian Peninsula after being confirmed in 2012. Humans can get it by drinking unpasteurized camels’ milk. Despite protests from hog producers and some politicians over the name, “Swine Flu” is not a misnomer. While it cannot be spread by eating pork, the virus contains five genes that normally circulate in pigs and is now considered a human influenza virus. Hogs infected with it were also found in three other countries, including Canada. 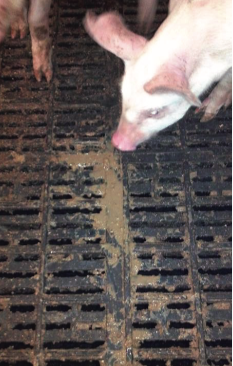 And, yet another virus “of swine origin” was isolated in three people in Saskatchewan in 2010. All worked at the same large hog operation. So, are we taking livestock diseases seriously enough? As the CDC cautions, "The more animals are kept in close quarters, the more likely it is that infection or bacteria can spread among them. Concentrated animal feeding operations or large industrial animal farms can cause a myriad of environmental and public health problems?" breathe fresh air and roam in spacious pastures. A PinP photo. There are now six confirmed PED cases in Southeast Manitoba in the 2018 outbreak, including three finisher operations, two sow operations and one nursery operation. Biocontainment is in place on these premises. Manitoba Pork and the Chief Veterinary Office strongly recommend enhanced biosecurity steps be taken on all premises and by all stakeholders in the area bounded on the West by PTH 75, North by PR 210, East by PTH 12, and South by Rd 34 N. This recommendation is meant to provide easily recognizable boundaries for all involved. Consult your veterinarian on enhanced biosecurity protocols that can be implemented on your premises. Part 11 - The Price we Pay for Corporate Hog$. Part 1V - The price we and our environment will pay for an expanded hog industry in Manitoba. Part V - So what's behind Manitoba's crusade to rapidly expand industrial hog production. Click here and find out! Larry Powell lives in Shoal Lake, where he publishes PlanetInPeril.ca Larry has served briefly as a member of the environmental monitoring group, Hog Watch Manitoba. POSTSCRIPT: I have gleaned the above information from the most reliable sources I can find - government agencies, world health authorities, scientific research studies published in peer-reviewed journals and, in some cases, industry itself. But please consider this a “sampling,” rather than a complete chronicle. l.p.
Don't you care? Then why not make a comment? The article, as far as I can tell, is factually correct. The evidence seems quite clear that intensification, especially of pigs and poultry, is associated with emerging infectious zoonotic disease, foodborne disease, and antimicrobial resistant pathogens. At the same time, smallholder systems in very poor countries, with weak health services, are mostly responsible for endemic (or day-to-day) zoonoses. We have concern that intensification in developing countries may be even more risky than intensification in rich countries, because the environment is more suitable for disease and there is, on the whole, less governance and management of livestock. Pork producers are now worried about yet another disease that could devastate herds in the US. And they are "prepping" lawmakers there for the possibility of shelling out more public funds to counter the threat. COULD THE DISEASE COME TO CANADA? You be the judge. Below is a transcript of the pig industry's Canadian radio show, "Farmscape." The President-Elect of the National Pork Producers Council says the creation of a Foot and Mouth Disease Vaccine Bank will help mitigate losses in the event of an FMD outbreak in the United States. The National Pork Producer's Council HAS BEEN LOBBYING GOVERNMENT FOR FUNDING to create a Foot and Mouth Disease Vaccine Bank. David Herring, the President Elect of the National Pork Producer's Council, told those on hand last week for World Pork Expo in Des Moines there's not enough vaccine available in the United States to accommodate a USDA policy change from using euthanasia to eradicate Foot and Mouth Disease in the event of an outbreak to one of using vaccination. Over the last 20 years we have gone from four or five percent exports to almost 25 or 26 percent exports. If we would get a Foot and Mouth Disease outbreak here in the United States, overnight we would lose our export markets so what we're trying to do is a preventative tool to have in our box so maybe we could regionalize the outbreak and help open those export markets quicker. Any way you cut it, if we get a Foot and Mouth outbreak in the States, it's going to be very expensive. The markets will close automatically but it could happen in many different ways. We could have a small regional outbreak and possibly mitigate the damages and help maybe keep some of the parts of the country open to exports but any given day in the United States we have anywhere from 350 to 400 thousand pigs on the road so we think it would be very hard to regionalize it so we need a volume in this vaccine bank so we can go and vaccinate and help mitigate the damages. Herring right now there wouldn't be enough vaccine available to even vaccinate the pigs in the county in which he lives so creating a vaccine bank is an important precaution. 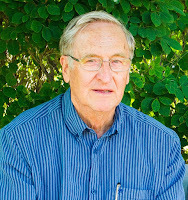 For Farmscape.Ca, I'm Bruce Cochrane."